Dr. Ruth MacPete talks ticks! For more from Dr. MacPete, find her on Facebook or at www.drruthpetvet.com. As the weather around the country gets warmer, our pets spend more time outside. However, being in the great outdoors can expose them to ticks and tick-borne illnesses. Make sure you know what you can do to protect your pets from tick-borne diseases. Ticks are more than just creepy; they can spread a number of different diseases that affect both pets and people. Ticks can transmit Lyme disease, Ehrlichia, Rocky Mountain Spotted Fever, anaplasmosis, tularemia, and babesia. So what can you do to protect your pets and your family from tick-borne diseases? The best way to treat an illness is to prevent it in the first place. The same applies to tick-borne disease. Fortunately, there are numerous products available to prevent tick infestations. Topical medications and medicated-collars are effective at keeping ticks away from your pets. Depending on where you live and your pet’s risk factors, your veterinarian may also recommend additional protection like a vaccination for Lyme disease. Although these preventative measures are effective, it is important to note that none provide 100% protection. Since no preventive treatment can be completely foolproof, it is still important to inspect your pet for ticks on a daily basis. Know what ticks look like, study up on the lifecycles of ticks, and give your pet a head-to-tail inspection. Your pet will love the extra attention and you might find a tick before it has a chance to spread disease. 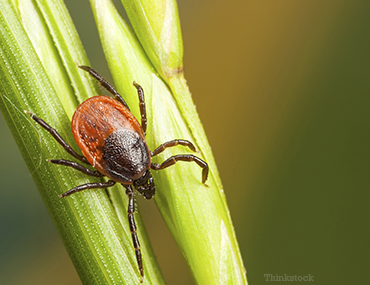 Since ticks need to be embedded for 24-48 hrs to spread infections, prompt proper removal is critical to minimize the risk of disease transmission. Ticks can spread a number of different diseases, so the signs and symptoms can vary depending on the disease. Some of the signs seen in several of these illnesses include: lethargy (loss of energy), loss of appetite, and lameness or reluctance to move. It is important to realize that more often than not the signs of a tick borne illness may be either very subtle or non-existent. In addition, many of the tick-borne illnesses mimic other diseases. Therefore it is best not to wait for symptoms to appear. If your pet has been exposed to ticks speak with your veterinarian immediately about screening tests and preventative products. For more information about ticks, how to safely remove them and ways to protect your pets and your human family speak with your veterinarian and go to www.dogsandticks.com. Learn more about Lyme disease here.